Table of Contents is what every blogger likes to add to his blog. It helps in decreasing the bounce rate of the blog and increasing the pageviews. A live working demo of this widget can be seen by clicking the below button. 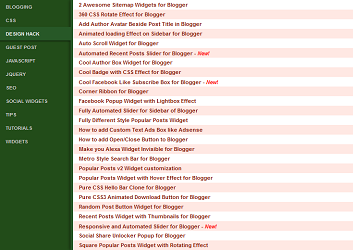 After seeing the demo if you wish to add this widget in your blog then follow the below steps. First of all we need to create a new page and to do this firstly go to Blog Title → Pages → New Page → Blank Page. Page editor will open, now click on HTML tab. Once you are in the HTML tab of Page Editor add the below code in it. Copy and paste the above given code in the post editor. Now change the URL in the blogUrl field. You may change other settings. It is briefly described in the code what they are and how to change them. After making the changes save the page. You are done now. Now you can link the page wherever you want. You and your visitors may now see this amazing table of content in your blogger blog. Muchas gracias. Eres un genio!! Hey! Wonderful contents widget, works a treat. Just wondering if there's any way to make the list of Labels wider, since I have a few long-ish labels? Hi Lewis to make the label side wider add the below given code just at the end of the code given in this post. was very useful ! ,. Thanks Man a great Widget! Can you just make a code for only selected labels..? I'm getting an error that says, "The server http://reader-download.googlecode.com:80 requires a username and password. The server says: Google Code Subversion Repository"
This code is not working in my blogspot blog. Fixed, you can check it now. Thanks for informing. It always stops on "Loading..." and no article is displayed. Can someone help, please? Thanks. Tried to add this and all it delivered on two different blogs was a green line with Loading... in it and nothing else unfortunately. Very useful and looking good. Hi,thank for your important tutorial about blogspot. For more,please visit my blog.